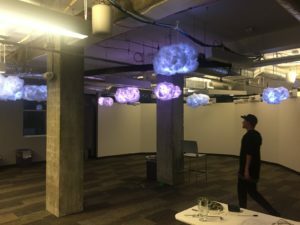 Alt Ethos: Experiential Design Studio creates disruption at Denver Startup Week by melding various forms of light, sound, interactivity and creative technology into memorable interactive experiences. Alt Ethos will showcase four exhibitions and participate in one panel discussion during the sixth annual Denver Startup Week. Alt Ethos has come a long way since last year’s Denver Startup Week. Events will take place September 25 – 29 at various locations in Denver, Colorado. The Commons on Champa has been the home of Alt Ethos since its inception. The support of this public hub for entrepreneurship serves as a platform for Alt Ethos to give back to the community during Denver Startup Week (DSW) where The Commons serves at Basecamp. Alt Ethos will showcase three exhibitions; “Gateway”, an interactive LED Hallway; “Social Wall”, where members of a community get their photo taken to create a mosaic of self-portraits to form a larger symbol logo of DSW; and “LED Clouds” illuminating the event space with ethereal lights. The Commons on Champa is located at 1245 Champa Street. Pon Pon is the late night hangout of Denver Startup Week. Monday, Tuesday, Wednesday, nights, 9pm to 1:30am, during Denver Startup Week and is located at 2528 Walnut Street. Free beer, wine & wells with DSW wristband with DJs and dancing. Alt Ethos fills the ceiling with a balloon surface sculpture and audio interactive visualization mapping in the gallery to entice late night socialites to fill their heads with wonderment. Win a cloud! Come drop your business card into the fishbowl in the events space at The Commons and be entered in a drawing to win your very own LED Cloud. Alt Ethos’ Paul Elsberg shares his expertise as a regional representative for Hackster.io for the panel entitled, “From Idea To Production”. Come and hear from the experts at Hackster.io and the Hardware Studio – a joint initiative from Kickstarter, Avnet and Dragon Innovation. Learn about the essentials of creating a compelling story that launches your idea into the marketplace while preparing yourself to scale! The panel is sponsored by AVNET and will be held at the Alliance Center in Denver from 2-5PM on Tuesday, September 26. Alt Ethos is seeking contractors for hire and will be at this year’s DSW Job Fair and Showcase. Come visit the Alt Ethos booth to find out more about positions in creative technology. The Job Faire will take place on Wednesday, September 27th, 6:00 pm – 9:00 pm, at the McNichols Building in Civic Center Park at 144 W Colfax Ave.
At last year’s events, Alt Ethos was listed as “Companies to Watch from Denver Startup Week” from Denverite and participate in DSW with a presentation entitled, “The New Dispensation: Virtual Reality” presenting a VR experience. They also introduced the Denver audience to “the Cube” a 6’ tangible interactive projection cube. The cube has since shown up at events around Denver such as 5280 Magazine’s Top of the Town. Since last year, Alt Ethos has proven themselves as a viable local company working with museums, local businesses, and public institutions. 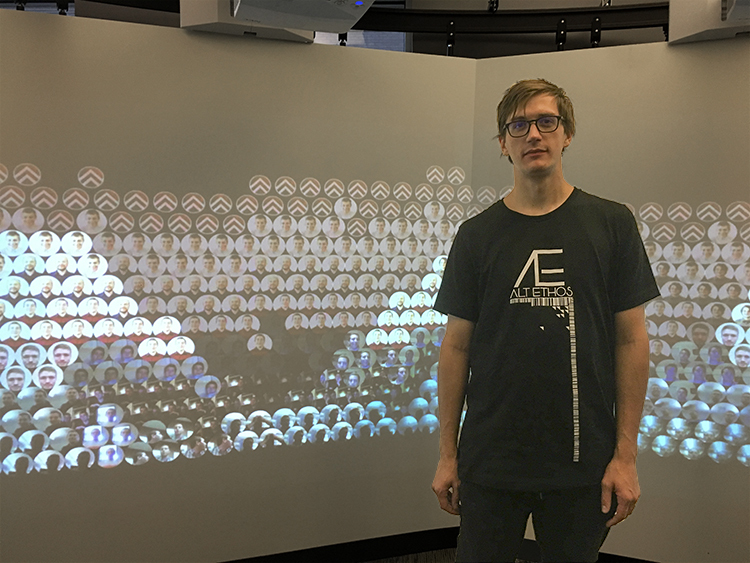 Zac with the new Alt Ethos t-shirt and a sneak peak at the Social Wall. Please join the celebration and education of Denver Startup Week, September 25 – 29 at various locations in Denver, Colorado. Help Alt Ethos celebrate their successes by visiting the disruptive experiential design on display at The Commons on Champa and Pon Pon. Alt Ethos is an experiential design studio specializing in creative technology. We are a group of dedicated creators, designers, and engineers creating innovative projects for the modern world. We meld various forms of light, sound, interactivity and creative technology into memorable interactive experiences. We create a variety of custom creative technology solutions with an emphasis on storytelling, hands-on participatory learning, and user experience design to amplify interactions with various media in the physical space. Alt Ethos donates a portion of its revenues to its sister organization, Denver Arts + Technology Advancement (DATA), a nonprofit organization striving to create a vanguard community center for public engagement, cultivating and strengthening local community by putting research, education, creation, and exhibition together under the same roof.